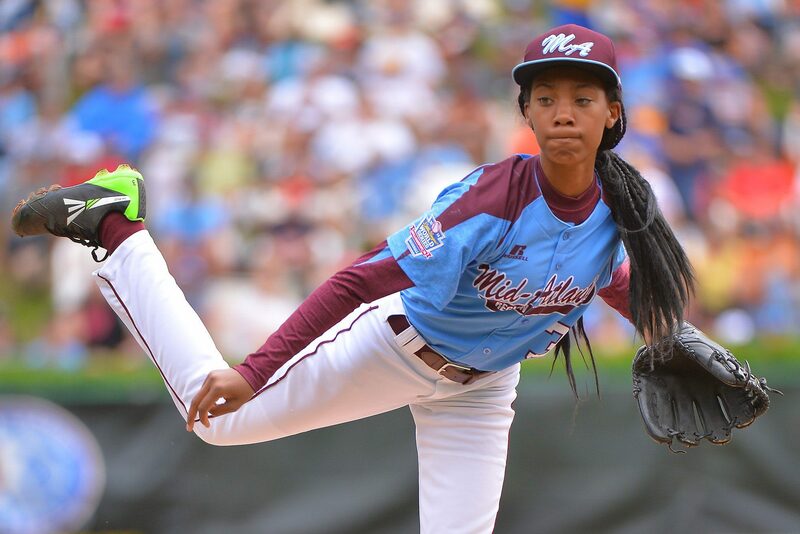 Mo’ne Davis pitching for the Mid-Atlantic Region in the 2014 Little League Baseball® World Series. In 1974, the Little League® Federal Charter was amended; allowing girls to play Little League Baseball® and the Little League Softball® program was created. That same year, tennis legend Billie Jean King established the Women’s Sport Foundation. In 1987, the foundation launched National Girls and Women in Sports Day, to celebrate the accomplishments of all female athletes, including the millions of women from around the world who are Little League graduates. Of those millions, there are only 18 that have played in the Little League Baseball World Series. In 2014, as Little League celebrated its 75th Anniversary and the 40th Anniversary of girls in Little League, two girls helped celebrate those milestones, helping their teams advance to the 68th Little League Baseball World Series. Mo’ne Davis on the Mid-Atlantic Region team and Emma March on the Canada Region team, were the 17th and 18th girls to play in the series. Ms. Davis made headlines around the world. Her performance on the mound for the Taney Youth Baseball Association Little League from Philadelphia helped the Mid-Atlantic Region Champions advance deep in the tournament. For the entire series, she threw 14 strikeouts and only allowed three earned runs in 8 1/3 innings pitched. Since competing with her team at the Little League Baseball World Series, she has returned back to Springside Chestnut Hill Academy, where she is on the honor roll and, as an eighth-grader, she’s playing varsity girls basketball. Ms. March also had a solid Little League Baseball World Series performance for the South Vancouver Little League team from British Columbia. Pitching and playing first base, she registered a fielding percentage of .917, with 11 putouts. Now in seventh grade Corpus Christi Elementary in Vancouver, the straight-A student is playing volleyball, soccer, and softball, with baseball and potentially football on the horizon. 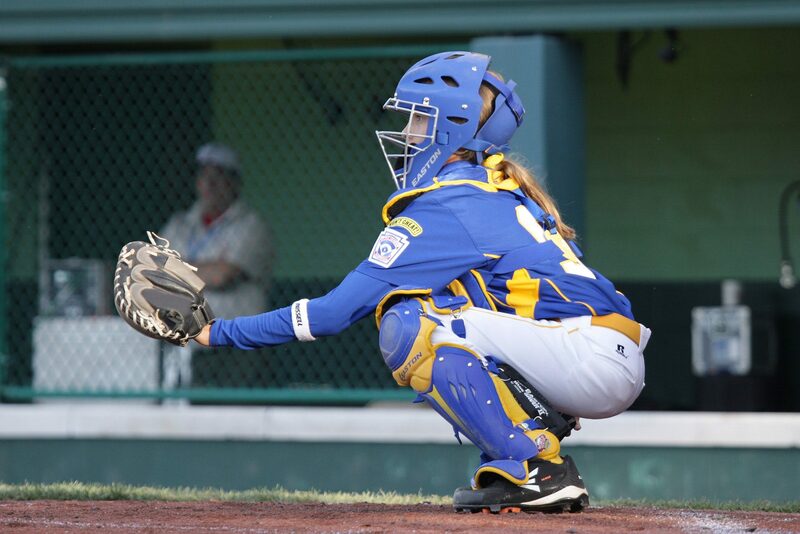 Eliska Stejsklova catching for the Europe-Africa Region in the 2013 Little League Baseball® World Series. Paving the way for Ms. March and Ms. Davis were 16 female athletes who helped their team reach the Little League Baseball World Series. The latest was Eliska Stejskalova, who played in the 2013 World Series for the Europe and Africa Region Champions from South Moravia Little League from Brno, Czech Republic. In 2014, Ms. Stejskalova made Little League history, again becoming the first girl to compete in two baseball World Series, when she played in the Little League Intermediate (50/70) Baseball World Series in Livermore, Calif. The first girl to play in Williamsport was Victoria Roche who played for Brussels, Belgium in 1984. And one of the most notable girls to play in the Little League Baseball World Series was Krissy Wendell, who played for Brooklyn Center, Minn., in 1994. Ms. Wendell went on to be the captain of the U.S. Women’s Hockey Olympic team, winning a silver and bronze medal. She was enshrined in the Little League Hall of Excellence in 2004. In addition to Ms. Davis and Ms. March, two girls have played in the same World Series three times, also happening in 2004 and 2009. And, when Emma March and Mo’ne Davis pitched in 2014 World Series they became the fourth and fifth female pitchers in World Series history.